The Selbaie West property is located 8 kilometres west of BHP Billiton’s past producing Selbaie mine and covers 12 kilometres of strike length of favorable stratigraphy. The Selbaie West project encloses the same felsic volcanic package that hosts the Selbaie Mine (53 Mt @ 1% Cu, 2.0% Zn, 0.6 g/t Au and 41 g/t Ag). The south part of the property also encloses the regional B-26 horizon. According to SOQUEM, the B-26 deposit hosts mineral resources of 6.8 million tonnes grading 1.1% Cu, 0.5% Zn, 0.4 g/t Au and 13 g/t Ag. In addition, inferred resources total 4.0 million tonnes grading 1.6% cu, 0.8% Zn, 0.4 g/t Au and 10 g/t Ag. Selbaie West is in the heart of one of the most active exploration areas of Quebec, referred to as the “Detour Belt” or “Detour Trend”. 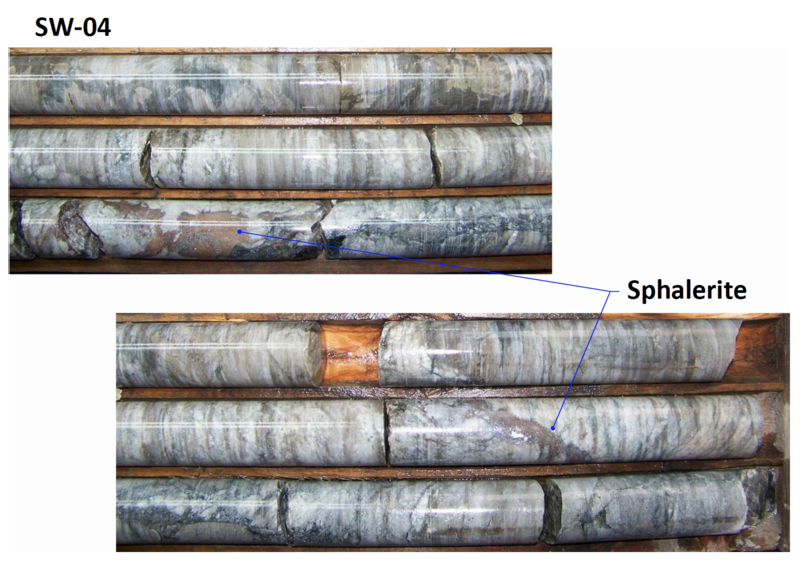 The property is essentially all overburden covered but limited lithogeochem data from diamond drill holes indicate a highly promising VMS environment, including high temperature rhyolites and strong chlorite alteration. The main targets for the 2015 program were located along the north and south contact of a large rhyolite complex largely in contact with a mafic/ultramafic intrusive. This setting suggests potential for a high heat flow regime favorable for VMS mineralization. Previous drilling by BHP Billiton has intersected anomalous zinc and gold values along both contacts, associated either with bedded cherts or stringer-type mineralization. Historical drilling located just to the south-east of the property yielded highly anomalous precious metal values, including an assay of 24.3 g/t Au and 1.8% Cu over 1.1 metres. More recently, Imperial Mining Group and SOQUEM reported, in the same area, drilling results up to 31.4 g/t Au and 132.5 g/t Ag over 1.45m, and 8.92 g/t Au over 5.1 m. Finally, drilling by NQ Exploration along the SE extension of our target horizon intersected a silver-zinc mineralized zone with assays up to 210 g/t Ag over 9.0 m, 93 g/t Ag over 16 metres and 281 g/t Ag over 6.0 metres (including a spectacular 1,790 g/t Ag (52 oz/t Ag!) over 0.45m). 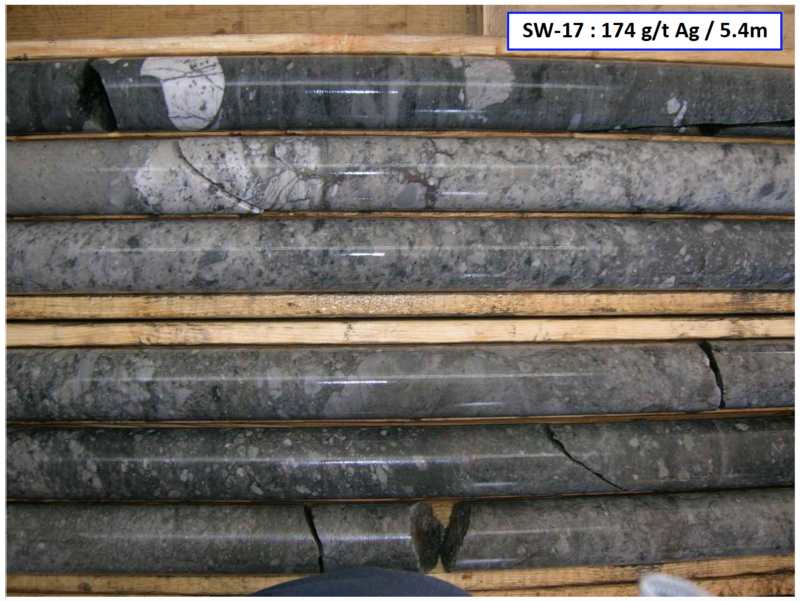 Drilling done by Cogitore in 2008 intersected 2 metres of low grade massive pyrite and a zone of stringer sulphides which returned 1.6% zinc over 3.1 metres (incl. 0.3% copper and 7.1% zinc over 0.3 metres). Other encouraging results included stringer sulphides assaying 1.7% zinc and 264.0 g/t silver over 0.3 metres. Drilling done in 2012 in the southwestern part of the property led to the discovery a rich silver-zinc occurrence grading up to 173.6 g/t silver and 0.5% zinc over 5.4 metres, and of a gold-copper structure grading up to 3.2 g/t gold and 0.4% copper over 1.3 metres. These new mineralized silver and gold mineralized zones are located along the north contact of a favourable rhyolite unit in an area where previous drilling by BHP Billiton had also intersected elevated values of gold and zinc associated with bedded cherts or stringer sulphides. This north contact is also along the western extension of the mineralized structure in which NQ Exploration Inc. has published a mineral resource estimate of 1.6 million tonnes grading 94.5 g/t silver in its Carheil project. SOQUEM recently announced the acquisition of the NQ property and the beginning of a drilling program in January 2018. This north contact is also in a setting similar to the B-26 deposit. 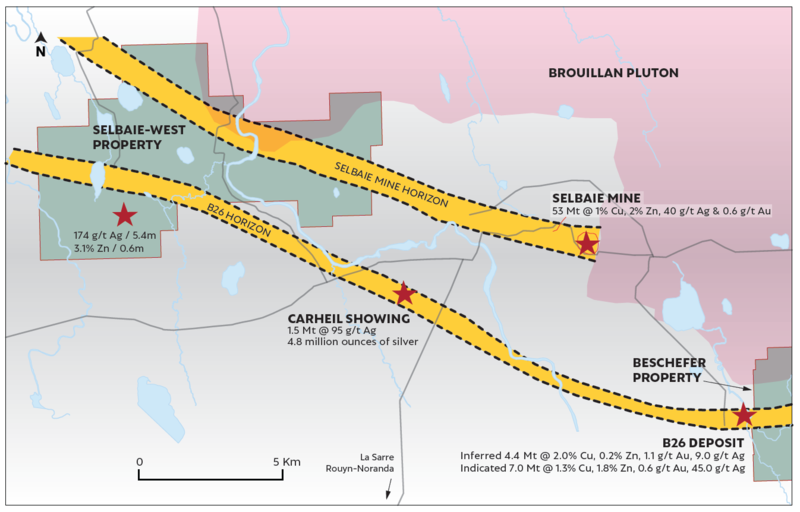 Although still at the grassroots stage, the Selbaie West project represents a good opportunity for early success in a still under-explored, yet promising area of the Abitibi belt.